Royal Purple Lavender is a gorgeous dark purple English lavender with a nice tidy habit and amazing fragrance. Bred in 1944 at Norfolk Lavender, it is used mainly for drying. Like Hidcote Lavender, it retains more of its color than lighter colored English Lavenders when dried in an arrangement or bundle. It also remains fragrant for years, even when exposed to the air. 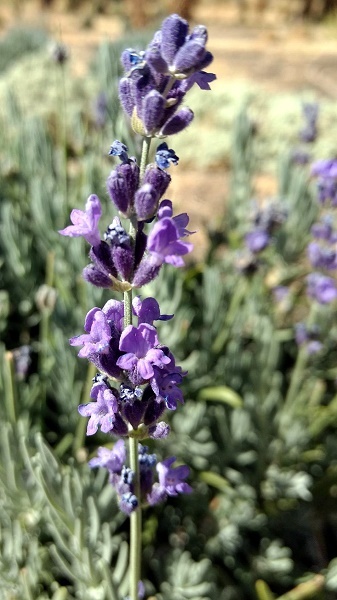 Royal Purple Lavender gets about two feet tall and has blooms that are about 10 inches long. It makes a nice hedge for full sun areas. It's bright violet-blue purple flowers go well with pinks and yellows. This plant is often available in plug trays. These trays hold 128 of all the same plant. They are a great low cost way to fill a lot of space. Each cell is 3/4 of inch by an inch. Check here to see if Royal Purple Lavender Plug Trays are available. Royal Purple Lavender makes a great addition to our Zone 5-11 Fragrant Herb Garden Six Pack.